UAA - Uniform Adoption Act Links Page - "The Evil Act"
My apologies! Part of this page of informative UAA links got screwed up and must be reconstructed! Ya think someone from the National Council for Adoption hacked me? THE LINKS WILL RETURN! In the meantime, you can also get an appreciation of the UAA from a recent game show transcript (yeah, right) below. With your host, Garry Moore! With apologies to the old TV show, "To Tell the Truth"
“It’s a lie, lie, you’re telling a lie. And here are our three contestants! ANNOUNCER: Number 1, what is your name, please? Number 1: My name is the UAA. ANNOUNCER: Number 2, what is your name, please? Number 2: My name is the UAA. ANNOUNCER: And Number 3, what is your name please? Number 3: My name is the UAA. "I am the UAA, a model of adoption legislation. Designed back in the Carter years by a mixed group of experts to open records in adoption, the Reagan years saw my evolution become a bill tighter and tighter, and more favorable to adoptive parents, and more restrictive in terms of records access. Once viewed as the key to a healthy and open future for participants in adoption and the adoption industry, I am now a vehicle to keep records closed, and allow attorneys and others in the process to lie and hide whatever they wish, because when records are closed, they do not fear disclosure. I am now viewed with horror by all members of the adoption triad. Birthparents, siblings, adoptees and even adoptive parents are now concerned about the impact I may have on innocent human beings. I have been marketed around the country by the NCFA, and state by state, I have been blown off. So hated am I, that at times I think my only friend is Bill Pierce. I hope to find acceptance now by the state which claims "You've Got a Friend in Pennsylvania" as I have been introduced there in the PA House of Reps for the second time by Ed Krebs of Lebanon County, known as House Bill 654. Tonight, I hope you can learn more about me and my mission, and discern which of us three bills here tonight is THE REAL UNIFORM ADOPTION ACT. Signed, Sincerely, The UAA." GARRY MOORE: Kitty Carlisle, we'll start with you. KITTY CARLISLE: Number 1, is it true that you only allow a birthmother 8 days after birth to revoke a decision made to place the child for Adoption? NUMBER 1: Yes, that's correct. KITTY CARLISLE: Number 1, is it also true you have good provisions for notifying a birthfather if he has a child that is going to be placed for adoption? KITTY CARLISLE: PHEW! Garry, I'm afraid I have to disqualify myself. I know what the UAA is made of, and based on that, I have to say that I can smell it from here. I'm sorry. GARRY MOORE: Ok, thank you Kitty. And so we move down to Bill Cullen. BILL CULLEN: I smell something too but I can't tell where it's coming from. Number 2, do YOU have good provisions for notifying birthfathers? BILL CULLEN: Number 1, if a family adopts an older child, how long do they have to see if the new little family member is fitting in okay? BILL CULLEN: Huh! Number 3, what is the standard for good social work in evaluating a home for suitablility for adoption- what I mean is, how many days or months can go by and a home study still be considered current? I mean, obviously we want a home study that is accurate and recent, so how recent should a homestudy be? NUMBER 3: Thirty days, which is standard social work practice. BILL CULLEN: Thirty days. How about you, Number 2, Thirty days? NUMBER 2: Thirty days is correct and standard. BILL CULLEN: Number 1, do you agree with 30 days? NUMBER 1: No, 18 months is suitable. PEGGY CASS: Let's see, if this bill is so hated, I don't see a problem with 30 days, that sounds reasonable, but 18 months? Wow! A lot can change in a family in 18 months, and they'd still be qualified to adopt? Hmm. Number 3, do you have good provisions for notifying a birthparent of a pending adoption? NUMBER 3: No, basically if the birthmother says she doesn't know who or where the birthfather is, no effort is made to contact him. PEGGY CASS: Number 1, do you agree? NUMBER 1: Well, if a man doesn't even know his significant other is pregnant, who cares about his rights? PEGGY CASS: So if a couple fights and breaks up, or I don't agree with a person's ethics, I can just disregard his rights, right? Thank you. Number 2, what about sealed records? Do you seal them? NUMBER 2: Uh, til the adoptee is 18. PEGGY CASS: Number 3, how long? NUMBER 3: I don't do it. NUMBER 1: Yes, 99 years. PEGGY CASS: 99 YEARS? What are you, crazy? If records are sealed 99 years, that means an adoptee has no right to their own birth certificate! PEGGY CASS: Unbelievable. Number 3, say I'm a birthmother. Say in 18 years or so I want to know if I made a good decision and that my adult child is ok? Am I prohibited to do this? NUMBER 3: Yes. You gave up that right. PEGGY CASS: Number 1, same question. NUMBER 1: Yes, you can't look, it's a felony. PEGGY CASS: A FELONY? To know if my kid is ok is illegal? What kind of punishment, Number 1? NUMBER 1: Depends on the state. In PA, a fine of up to $10,000, in some states, as I was presented, the punishment is possible jail time. PEGGY CASS: Criminey! What if I'm an adoptee, or a friend of an adoptee, or an adoptive parent, is it a felony for me to search too? GARRY MOORE: And on down we go to Nipsy Russell. NIPSY RUSSELL: Number 1, is it true that Bill Pierce put up a cowardly cardboard sign and didn't even look out his window when a demonstration was held at the NCFA office lately? GARRY MOORE: Nipsy, I'm sorry, I have to ask you to stick to questions directly related to the UAA, as close as the NCFA is to the bill. Such wordplay! These "bills" and that "Bill" are practically one and the same! Hah-hah! NIPSY RUSSELL: Hah-hah, sorry Garry, I see. Ok, Number 1, who is this law protecting? Lawyers? NUMBER 1: It's keeping a promise of confidentiality to birthmothers. NIPSY RUSSELL: Is that why they are all over the net looking for their kids and swearing they were never promised confidentiality and don't want it? I know that many of them recall being promised that their child could find them when they turned 18! You think they are all scared, what decade are you in? Strike that. Hmmm. Number 1, does the adoptee have any rights- like, do they at least get some decent non-id? I mean, if they can't know who they are or their health histories, that's bad enough, how about info? NUMBER 1: They can get non-id. NIPSY RUSSELL: They can get non-id, ok, how much? How do you define non-id? NIPSY RUSSELL: You don't define non-id? You are saying an adoptee is entitled to non-id but you don't say what it is? Shoot, get a social worker on a bad day, and you'll get 3 sentences. That's not right- adoptees can't know their origins, and they can't even get a minimum of info on themselves. Huh. Number 1, what's your best marketing tactic? NUMBER 1: I like to tell people that I am a friendly and fair bill because I establish a registry which allows people to find one another. 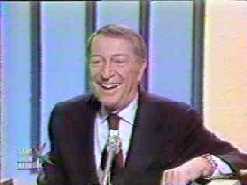 GARRY MOORE: Ok, panelists, you've done a fine job, but we're all out of time. Let's see how you vote. We have one disqualification from Kitty Carlisle, so let's see what Bill Cullen has to say. BILL CULLEN: Well, I was leaning toward Number 3, but when he said he didn't seal records, I then ruled him out. Number 2, I'm not sure about you, but I am surer that Number 1 has the toughest provisions, so I'm voting for number 1. GARRY MOORE: Peggy Cass, what do you say? PEGGY CASS: Well, I am going with my instincts. I agree with what Bill said about the tough provisions, but from the minute those bills walked in, I just had an icky feeling about Number 1. He's a little shifty, he won't look you in the eye, and if what he says is true, I wouldn't be able to make eye contact either. Eight days, felony to search, don't worry about the birthfather, lousy social work, sealing for 99 years. No wonder he's skulking. GARRY MOORE: And a skulk vote for Number 1. Nipsy Russell, your thoughts. NIPSY RUSSELL: He spouted off judgements like Atilla the Hun, so I'm casting my ballot with Number 1! GARRY MOORE: Poetically said, Nipsy, as always. Well, the time has come for the real UAA to reveal himself, so now... Will the REAL UAA please stand up? GARRY MOORE: So, it's YOU Number 1. Tell me, how do you have the audacity to- wait, what's going on? PEGGY CASS: Omigod, they're storming the stage! NIPSY RUSSELL: Holy mackerel, bless my soul, it looks like the audience is out of control! GARRY MOORE: I guess we have to call security, but tell them to take their time, huh? KITTY CARLISLE: Hey! Don't trample on my feather boa! Oh bother! Here, just take it and hang him with it! GARRY MOORE: We'll be back after this word from our sponsor. Can somebody get a mop for that bill? Yecch! • Birthmom has 8 days after birth to revoke her decision to relinquish. After that, too late lady! • Birthdad is lucky if he hears about his child going up for adoption. If attempt is made to notify him, he has 20 days to respond or loses his rights. It's 10 o'clock. Do you know where your sperm is? • Records are sealed for 99 years! • Older adopted child must be adopted in 30 days by prospective family- how fast would YOU adjust to a new home and people and rules? How fast do you think a prospective parent can make this judgement call? • Non-id is not defined, so God knows what you'll get for info if you are an adoptee. • An adoptive family checked out in a homestudy 18 months earlier is STILL considered clear to adopt- no mandate for checking on them shortly prior to the child's arrival. Current standard social work practice is 30 days, not 18 months! • Sealed records are most helpful to lawyers and social workers, but the people whose lives are bound by them can't see them. Who is being "protected"? How would you feel about "secret files" being kept on you? • Promotes falsified birth certificates that make it look like your adoptive parents gave you life. Thanks for helping insecure adoptive parents lie! • Pretends to be cool because it establishes a registry. Been there, done that, it doesn't work, especially for the dead, siblings, those whose adoptive parents lied to them, and people whose birth info was falsified. • Makes it a FELONY to search for your kin! If you're in Pennsylvania, be glad this "model" legislation didn't pass here. And if you see Mike O'Pake or Ed Krebs, tell them where you stand on open records, because right now, this seems to be all the "vision" they had. Thankfully, HB 654 never passed! Searchers Shocked Anyone Could Consider this Legislation. If you liked this page, then this parody may also tickle your fancy. Add this number: to about 1800, and you'll know now many people visited this page. Don't you hate having to rebuild a screwed page?